Who doesn’t love a good sing-song? 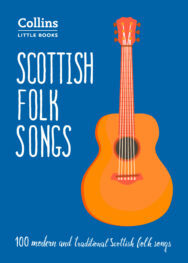 And we’re lucky in Scotland that we have a back catalogue of folk songs that will easily have you stamping your feet. HarperCollins have just released this dinky delight of a pocketbook full of our very best, and here we reproduce Hamish Henderson’s legendary ‘Freedom Come All Ye’. Through the great glen o’ the warld the day. Mourn the ships sailin’ doon the Broomielaw. Mak’ the vile barracks o’ their maisters bare. Can fi nd breid, barley bree an’ painted room. Dings the fell gallows o’ the burghers doon.